Opponents of a proposed uranium mine northeast of Fort Collins said Tuesday the mine could affect cities and towns across the Front Range because it would tap into an aquifer that provides water to numerous areas. 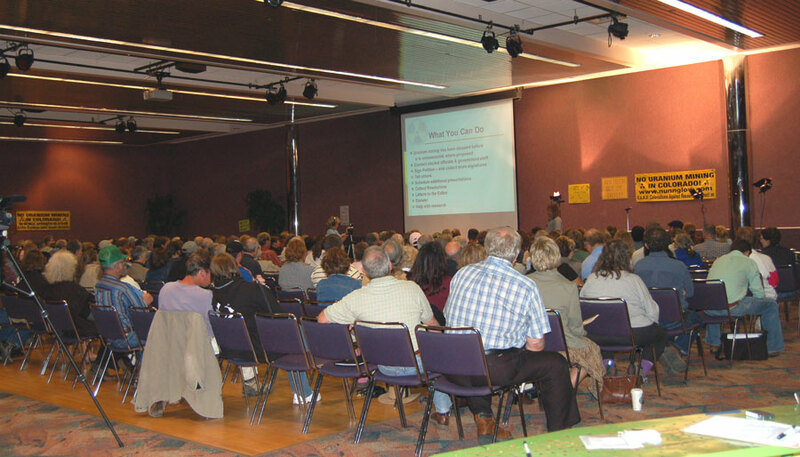 More than 150 people, most of them from Fort Collins and Larimer County, listened to a presentation given by Coloradoans Against Resource Destruction, or CARD, discussing the long-term and wide-spread negative impacts of the possible 5,760-acre mine in Weld County east of Wellington. "People need to realize it's very close to Fort Collins," said Lilias Jarding, a member of CARD. "It poses huge danger to our water, our economy and our way of life." CARD is a volunteer group that formed in response to the announcement of the uranium mine proposed by Powertech (USA) Inc.
Powertech, a Canadian company that owns the mineral rights to the land, said they would use an in-situ mining process where treated water is pumped under high pressure to extract uranium ore from underground deposits in the area. While Powertech officials have said the process is safe and will be carefully monitored, opponents in Larimer and Weld County are not appeased. "I don't see how anyone who lives here ... would even consider taking the risk of poisoning everything that we love about this state," said Carol Ostrom, a Fort Collins resident. Uranium, a radioactive substance, can cause long term effects like cancer, mutations, birth defects, burns and radiation sickness, according to the Environmental Protection Agency. Members of CARD asked attendees to sign petitions, contact government officials and oppose the mine in any way they could before the company begins filing permits to mine the land. Larimer County commissioners Kathay Rennels and Randy Eubanks attended the meeting but would not give a formal statement on their position of the topic. "We have asked for feedback from our environmental advisory board," Eubanks said. "I want to get that feedback from the scientific board that we have." Rennels told the audience that Larimer County commissioners could only supply commentary in the decision, as the final verdict is up to Weld County commissioners. "We are a commenting agency, but I think we are a loud commenting agency," she said. Opponents also discussed a resolution passed by the Larimer County Medical Society against uranium mining "due to the adverse health impact on agriculture, livestock and civilian population."